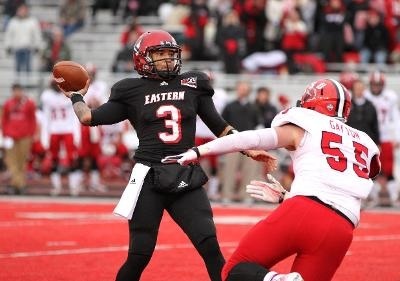 Congratulations to the Eastern Washington University Eagles for advancing to the FCS semi finals. Today the #3 ranked Eagles beat the 20th ranked Jacksonville State Gamecocks 35-24 on the beautiful red turf at Roos Field in Cheney, WA. The Eagles (12-2) now are winners of 10 straight since their last loss back in September. Eastern was led by dominate performances by QB Vernon Adams Jr. (324 yards passing and 2 TD’s,) RB Quincey Forte (190 yards rushing and 2 TD’s,) and WR Ashton Clark (181 yards receiving on 11 catches with a TD.) The biggest score of the day for the Eagles was provided by the defense in the 4th quarter by true freshman linebacker, Albert Havili, whose 77 yard pick 6 helped clench the victory. “There might be games that are smooth and rhythmic. There might be other games that are defensive battles. We consistently are able to make adjustments and find ways to win in whatever ball game it is. To do that is tougher than you might think.” – Beau Baldwin, Head Coach, EWU. Eastern will now host the Towson Tigers this Saturday, December 21st at 11 am for the right to advance to the championship game. The Eagles were FCS champions in 2010 and have advanced to the semifinal round 3 of the last 4 seasons. You can catch Saturdays game on ESPNU or ESPN3. Go Eagles!